How to test the crosstalk of 3D television monitors? With the advent of 3D television at low price on the market, making his own 3D pictures becomes a new challenging hobby. I have thus designed my own 3D photographic system (to be described later) and made a collection of pictures during my holidays to be projected to my family on my just bought 3D TV. After a few experiments, I have been disappointed by the crosstalk observed on some pictures on my television set (left eye could see the right image and thus ghosts appear on the screen) . Although it is sometimes possible to correct some images and cancel the ghosts observed on the picture, the technique is not applicable to all images thus this crosstalk is really annoying. Moreover, it decreases the resolution by slightly blurring the pictures. To compare different equipments and eventually to replace my new TV by a better one, I decided to design a test which can be easily performed and which can quantify the degree of crosstalk on a scale. This chart test is given on the first image below and some first results are reproduced. Below is the test chart to visually estimate the crosstalk level of a 3D television or PC monitor. This chart is a 1920X1080 side by side image which can be downloaded and copied on the television screen. 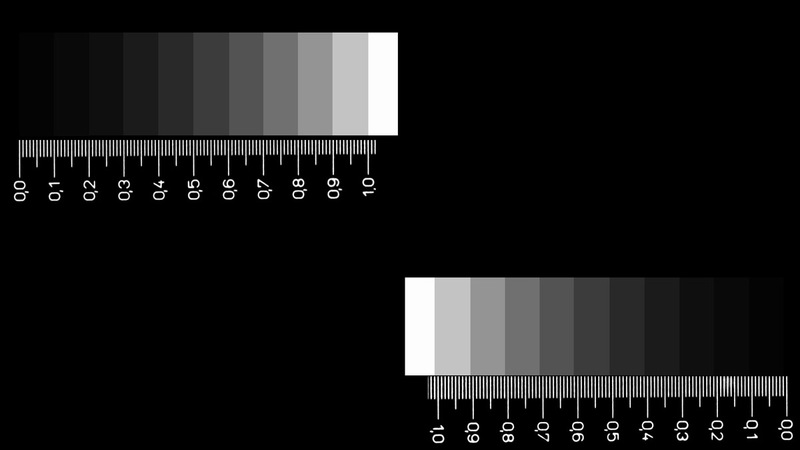 To measure the crosstalk, switch the TV to the 3D side by side mode and simply look at the gray chart on the screen with one eye only (left chart with left eye) and note the value on the scale below the gray chart where the first rectangle appears visible. If the monitor has no crosstalk, this grey chart should be completely black but this is not always the case in practice. This let you compare different TV screens, PC monitors and 3D projectors without any sophisticated equipment. Then you can go to the shop with your USB stick and simply test your new equipment before buying and maybe make a better decision as me (I had no test method when buying). This chart could be obtained as an MPO file from the author. Picture below is the view of the chart without any 3D glasses with the 3D side by side viewing mode activated on the TV screen. The image seems to be perfect 2D but the 2 gray scales are in fact situated on the left and right images. 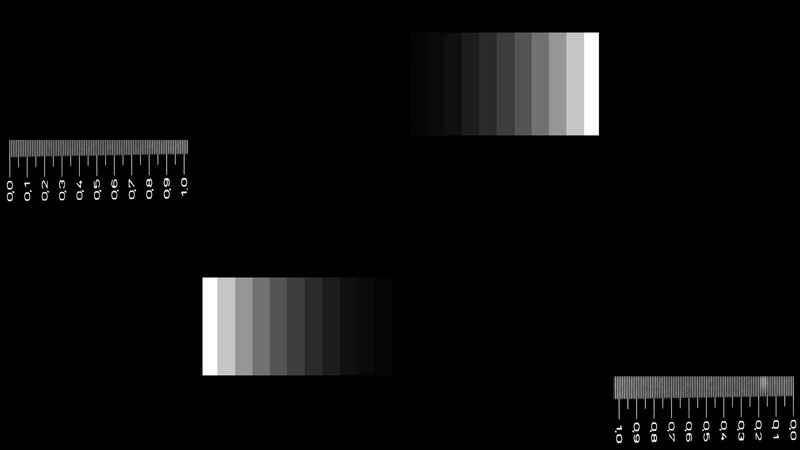 If the left gray scale is looked at with 3D glasses with the right eye closed, it should appear black if the system has no crosstalk. It is never the case except of course with a mirror stereoscope. Picture below is the same chart viewed without glasses with the Stereo Photo Maker software in the color anaglyph mode. This explains better the way the chart is working. At the top left of the image is the gray chart of the right eye picture with the scale of the left eye picture. If we look at this picture part through glasses with red filter on left eye and the right eye closed we should see of course the red scale very bright and the cyan gray scale very dark if the red filter and the monitor screen are perfect. The same is true for the bottom right side of the picture if we look at it with the right eye covered with a cyan filter and left eye closed. Remember that this test chart should be used one eye at a time. Let's see the results on the next two images. I have reproduced below the visual impression of the chart in anaglyph mode seen through a red filter on left eye (right eye should be closed). 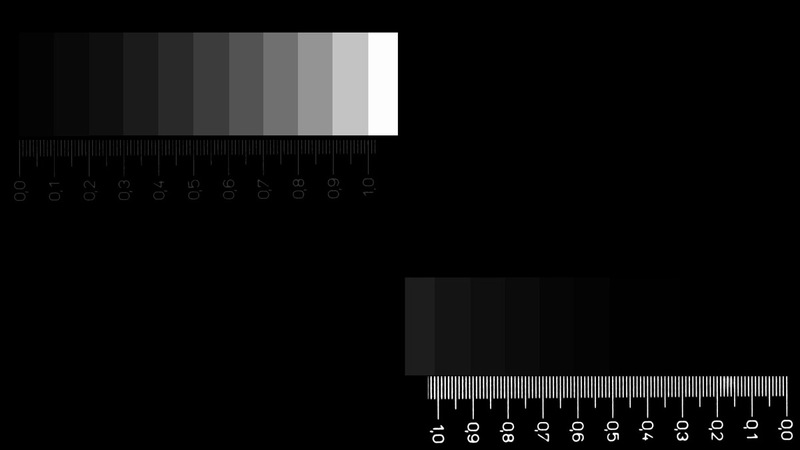 We can see that the gray scale on the left side is not perfectly black. It is of course attenuated by the filter but this is far from perfect so the left eye sees an attenuated right image which can produce ghosts in some parts of the picture. 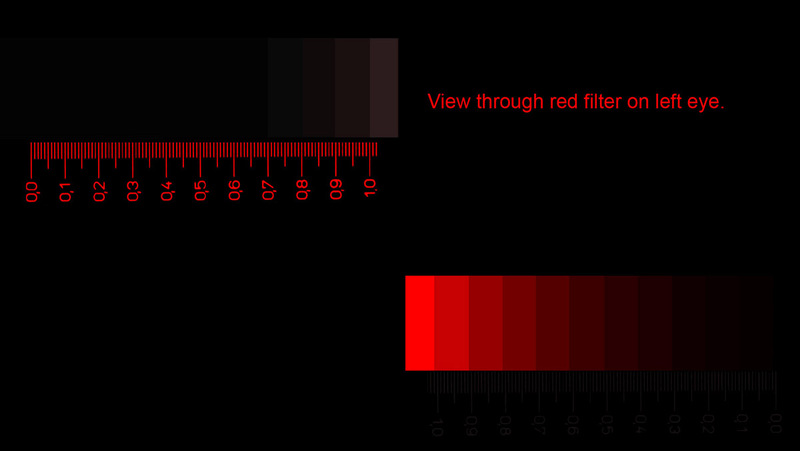 The right part of the chart is not used with the red filter. With the scale below I can rate this filter as 7/10. Other red filters could be tested, I have a lot of them but this is about the best I have seen. For the test of the cyan filter see below. To see the test result with the cyan filter on right eye ( left eye closed), look at the bottom right of the chart. 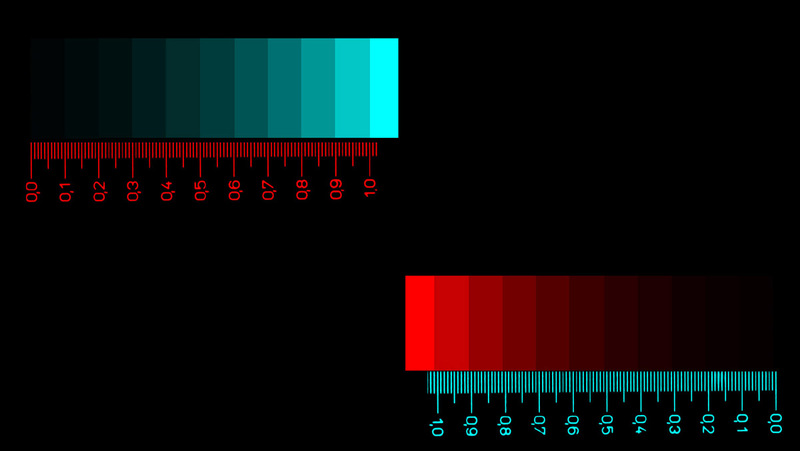 We can immediately notice that the cyan filter is better for 3D rendering than the red filter. It can be rated as 9/10. The anaglyph glasses are not symmetrical. Next is the test of my 3D Samsung TV screen. I have reproduced here the test of my Samsung TV with the right eye open which wears the Samsung 3D active glasses. As the results are exactly the same with both eyes, I do not give the test for the left eye. On the bottom right of the image below, we can see that the level of crosstalk is not at all negligible for this device, it gets a rating of 5/10. Note that all the pictures presented here reproduce the visual impression so the rating is given visually. Photographing the TV screen do not give correct results because the attenuation of the gray chart depends strongly on the exposure time. Is any better viewing device on the market? The answer is yes: I have recently tested an active Epson projector, it obtained a rating of 9/10. If the head is not perfectly positioned and slightly tilted, crosstalk appears also for this projector. I should continue my tests, maybe on a passive device.